CLICK HERE to hear an MP3 sample of "BOOMER'S LULLABY"
CLICK HERE to hear an MP3 sample of "Kidman"
Australia loves pioneers and outlaws. Not surprisingly, for a nation built from convict stock and with a history of taming vast wild spaces. 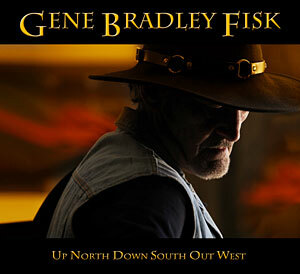 Gene Bradley Fisk is a pioneer and an outlaw, having carved his own musical path and influenced the direction of many fellow travellers. Born near the shores of Lake Colac in Victoria and within easy reach of Australia's Highway One, reputed to be the longest road in the world, Gene was bound to travel. From 1951 he served his country for 15 years in the Royal Australian Air Force, including overseas postings to Thailand and Butterworth, Malaysia, where he began his broadcasting career with Radio RAAF Butterworth in 1960 as one of their first announcers. Back in civvy street, Gene became a Disc Jockey on commercial radio in Victoria at 3HA Hamilton in 1967 and went on to 3CV Maryborough, 3BO Bendigo and 3GL Geelong. At 3UZ in the capital city of Melbourne, he hosted a top-rated Country Music program from 1977 until 1980 followed by similar programs on 3GL Geelong and community stations 3CCC Bendigo, 3PBS Melbourne & 3YYR Geelong in the 1980s and 1990s; Country FM Geelong -1994 to 2005. Gene championed the sound of the Outlaw Country movement and was instrumental in the spread of its popularity, and became the leading exponent of the genre in this country. As a performer Gene's musical career began when he joined a banjo club at the age of 11, playing concerts and radio shows. In 1959 while in the RAAF, he formed his first band, 'The Sidewinders' and throughout the next decades he fronted many bands. In 2001 Gene won 4 separate awards; Male Vocal, Best Independent release, Best Duo Open Section and Best Duo Victorian (with his daughter Donna Fisk) at the Victorian Country Music Awards with his release Way Over The Edge. His song Kidman, which he wrote about the great Australian legendary cattle king Sidney Kidman, won the 2003 Australian Independent Country Music Award for Best Heritage Track of the Year and stayed in the Top 20 of the Australian Country Music Charts for 15 weeks. Gene was inducted into the Australian Country Music Broadcaster's Hall of Fame in 1999 and inducted into The Australian Country Music Hands of Fame in 2005. 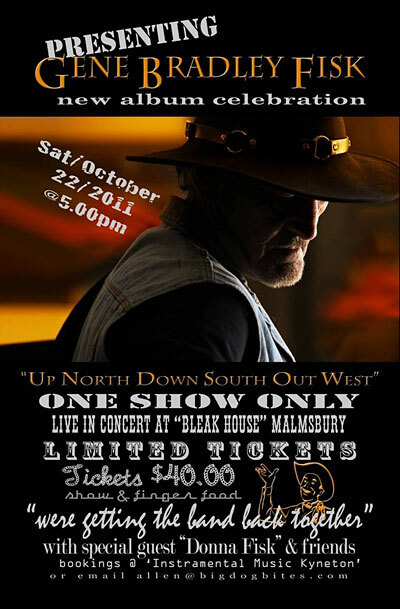 In 2011, he crowned his 50 year career with a new album, Up North Down South Out West, guaranteed to confirm his position in the history of Australian music. AUD $28 (within Australia), AUD $32 (Worldwide), includes postage and handling.